Emergency care professionals are increasingly expected to work autonomously when caring for patients with minor musculoskeletal injuries and conditions. They have to be able to competently and safely take a patient’s history, examine, diagnose and provide management of these conditions. 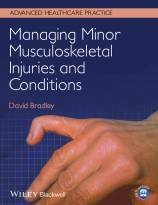 Managing Minor Musculoskeletal Injuries and Conditions pulls together all these aspects of care into one practical, easy-to-read text. David Bradley was formerly a Senior Lecturer in Emergency Care at Liverpool John Moores University, Liverpool, UK.